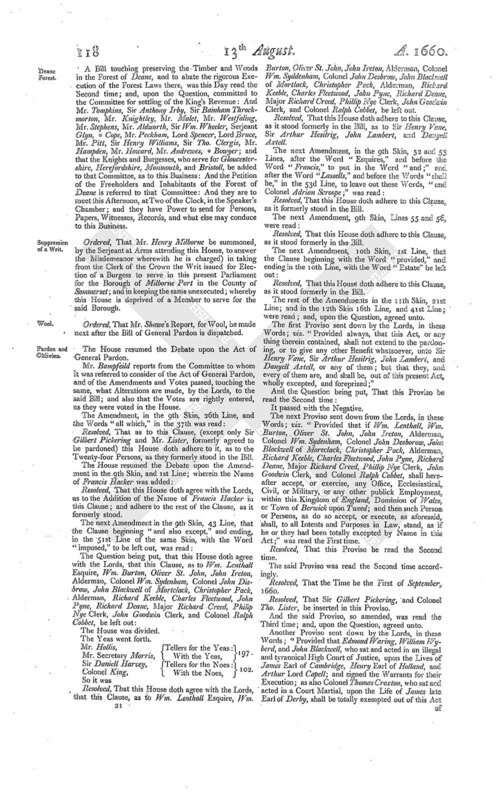 Journal of the House of Commons: Volume 8, 1660-1667. Originally published by His Majesty's Stationery Office, London, 1802. Leave to plead before Lords. Lords desire a Conference-Loan from City. ORDERED, That Mr. Wingfeild, a Member of this House, have Leave to plead before the Lords, in a Cause there, not concerning any Member of this House. A Bill touching preserving the Timber and Woods in the Forest of Deane, and to abate the rigorous Execution of the Forest Laws there, was this Day read the Second time; and, upon the Question, committed to the Committee for settling of the King's Revenue: And Mr. Tompkins, Sir Anthony Irby, Sir Bainham Throckmorton, Mr. Knightley, Mr. Malet, Mr. Westfaling, Mr. Stephens, Mr. Aldworth, Sir Wm. Wheeler, Serjeant Glyn, * Cope, Mr. Peckham, Lord Spencer, Lord Bruce, Mr. Pitt, Sir Henry Williams, Sir Tho. Clergis, Mr. Hampden, Mr. Howard, Mr. Andrewes, * Bowyer; and that the Knights and Burgesses, who serve for Gloucestershire, Herefordshire, Monmouth, and Bristoll, be added to that Committee, as to this Business: And the Petition of the Freeholders and Inhabitants of the Forest of Deane is referred to that Committee: And they are to meet this Afternoon, at Two of the Clock, in the Speaker's Chamber; and they have Power to send for Persons, Papers, Witnesses, Records, and what else may conduce to this Business. Ordered, That Mr. Henry Milborne be summoned, by the Serjeant at Arms attending this House, to answer the Misdemeanor wherewith he is charged) in taking from the Clerk of the Crown the Writ issued for Election of a Burgess to serve in this present Parliament for the Borough of Milborne Port in the County of Sommerset; and in keeping the same unexecuted; whereby this House is deprived of a Member to serve for the said Borough. Ordered, That Mr. Shawe's Report, for Wool, be made next after the Bill of General Pardon is dispatched. The House resumed the Debate upon the Act of General Pardon. 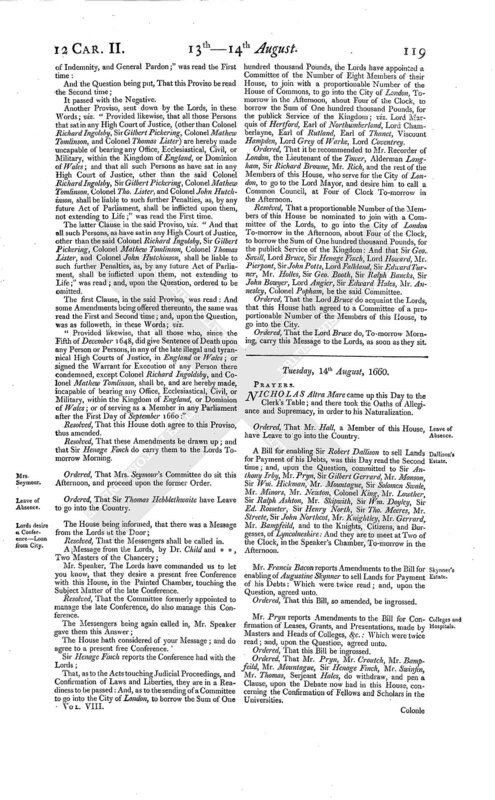 Mr. Bampfeild reports from the Committee to whom it was referred to consider of the Act of General Pardon, and of the Amendments and Votes passed, touching the same, what Alterations are made, by the Lords, to the said Bill; and also that the Votes are rightly entered, as they were voted in the House. Resolved, That as to this Clause, (except only Sir Gilbert Pickering and Mr. Lister, formerly agreed to be pardoned) this House doth adhere to it, as to the Twenty-four Persons, as they formerly stood in the Bill. Resolved, That this House doth agree with the Lords, as to the Addition of the Name of Francis Hacker in this Clause; and adhere to the rest of the Clause, as it formerly stood. Mr. Hollis, Tellers for the Yeas: 197. Sir Daniell Harvey, Tellers for the Noes: 102. Resolved, That this House doth agree with the Lords, that this Clause, as to Wm. Lenthall Esquire, Wm. Burton, Oliver St. John, John Ireton, Alderman, Colonel Wm. Syddenham, Colonel John Desbrow, John Blackwell of Mortlack, Christopher Pack, Alderman, Richard Keeble, Charles Fleetwood, John Pyne, Richard Deane, Major Richard Creed, Phillip Nye Clerk, John Goodwin Clerk, and Colonel Ralph Cobbet, be left out. Resolved, That this House doth adhere to this Clause, as it stood formerly in the Bill, as to Sir Henry Vane, Sir Arthur Hesilrig, John Lambert, and Danyell Axtell. Resolved, That this House doth adhere to this Clause, as it formerly stood in the Bill. Resolved, That this House doth adhere to this Clause, as it stood formerly in the Bill. The rest of the Amendments in the 11th Skin, 21st Line; and in the 12th Skin 16th Line, and 41st Line; were read; and, upon the Question, agreed unto. The first Proviso sent down by the Lords, in these Words; viz. "Provided always, that this Act, or any thing therein contained, shall not extend to the pardoning, or to give any other Benefit whatsoever, unto Sir Henry Vane, Sir Arthur Hesilrig, John Lambert, and Danyell Axtell, or any of them; but that they, and every of them are, and shall be, out of this present Act, wholly excepted, and foreprized;"
It passed with the Negative. The next Proviso sent down from the Lords, in these Words; viz. "Provided that if Wm. Lenthall, Wm. Burton, Oliver St. John, John Ireton, Alderman, Colonel Wm. Sydenham, Colonel John Desborow, John Blackwell of Moreclack, Christopher Pack, Alderman, Richard Keeble, Charles Fleetwood, John Pyne, Richard Deane, Major Richard Creed, Phillip Nye Clerk, John Goodwin Clerk, and Colonel Ralph Cobbet, shall hereafter accept, or exercise, any Office, Ecclesiastical, Civil, or Military, or any other publick Employment, within this Kingdom of England, Dominion of Wales, or Town of Berwick upon Tweed; and then such Person or Persons, as do so accept, or execute, as aforesaid, shall, to all Intents and Purposes in Law, stand, as if he or they had been totally excepted by Name in this Act;" was read the First time. Resolved, That this Proviso be read the Second time. The said Proviso was read the Second time accordingly. Resolved, That the Time be the First of September, 1660. Resolved, That Sir Gilbert Pickering, and Colonel Tho. Lister, be inserted in this Proviso. And the said Proviso, so amended, was read the Third time; and, upon the Question, agreed unto. Another Proviso, sent down by the Lords, in these Words; viz. "Provided likewise, that all those Persons that sat in any High Court of Justice, (other than Colonel Richard Ingolsby, Sir Gilbert Pickering, Colonel Mathew Tomlinson, and Colonel Thomas Lister) are hereby made uncapable of bearing any Office, Ecclesiastical, Civil, or Military, within the Kingdom of England, or Dominion of Wales; and that all such Persons as have sat in any High Court of Justice, other than the said Colonel Richard Ingolsby, Sir Gilbert Pickering, Colonel Mathew Tomlinson, Colonel Tho. Lister, and Colonel John Hutchinson, shall be liable to such further Penalties, as, by any future Act of Parliament, shall be inflicted upon them, not extending to Life;" was read the First time. The latter Clause in the said Proviso, viz. "And that all such Persons, as have sat in any High Court of Justice, other than the said Colonel Richard Ingolsby, Sir Gilbert Pickering, Colonel Mathew Tomlinson, Colonel Thomas Lister, and Colonel John Hutchinson, shall be liable to such further Penalties, as, by any future Act of Parliament, shall be inflicted upon them, not extending to Life;" was read; and, upon the Question, ordered to be omitted. The first Clause, in the said Proviso, was read: And some Amendments being offered thereunto, the same was read the First and Second time; and, upon the Question, was as followeth, in these Words; viz. "Provided likewise, that all those who, since the Fifth of December 1648, did give Sentence of Death upon any Person or Persons, in any of the late illegal and tyrannical High Courts of Justice, in England or Wales; or signed the Warrant for Execution of any Person there condemned, except Colonel Richard Ingoldsby, and Colonel Mathew Tomlinson, shall be, and are hereby made, incapable of bearing any Office, Ecclesiastical, Civil, or Military, within the Kingdom of England, or Dominion of Wales; or of serving as a Member in any Parliament after the First Day of September 1660:"
Resolved, That this House doth agree to this Proviso, thus amended. Resolved, That these Amendments be drawn up; and that Sir Henage Finch do carry them to the Lords To-morrow Morning. Ordered, That Mrs. Seymour's Committee do sit this Afternoon, and proceed upon the former Order. Ordered, That Sir Thomas Hebblethwaite have Leave to go into the Country. Resolved, That the Messengers shall be called in. Mr. Speaker, The Lords have commanded us to let you know, that they desire a present free Conference with this House, in the Painted Chamber, touching the Subject Matter of the late Conference. Resolved, That the Committee formerly appointed to manage the late Conference, do also manage this Conference. The House hath considered of your Message; and do agree to a present free Conference. 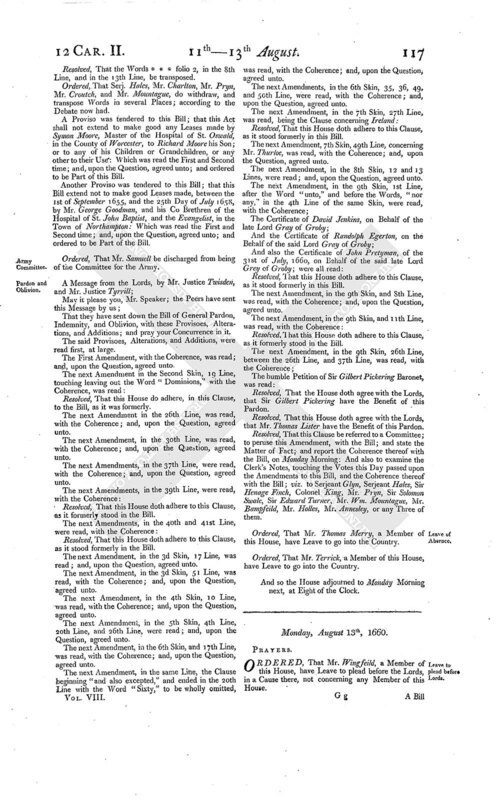 That, as to the Acts touching Judicial Proceedings, and Confirmation of Laws and Liberties, they are in a Readiness to be passed: And, as to the sending of a Committee to go into the City of London, to borrow the Sum of One hundred thousand Pounds, the Lords have appointed a Committee of the Number of Eight Members of their House, to join with a proportionable Number of the House of Commons, to go into the City of London, To-morrow in the Afternoon, about Four of the Clock, to borrow the Sum of One hundred thousand Pounds, for the publick Service of the Kingdom; viz. Lord Marquis of Hertford, Earl of Northumberland, Lord Chamberlayne, Earl of Rutland, Earl of Thanet, Viscount Hampden, Lord Grey of Warke, Lord Coventrey. Ordered, That it be recommended to Mr. Recorder of London, the Lieutenant of the Tower, Alderman Langham, Sir Richard Browne, Mr. Rich, and the rest of the Members of this House, who serve for the City of London, to go to the Lord Mayor, and desire him to call a Common Council, at Four of Clock To-morrow in the Afternoon. Resolved, That a proportionable Number of the Members of this House be nominated to join with a Committee of the Lords, to go into the City of London To-morrow in the Afternoon, about Four of the Clock, to borrow the Sum of One hundred thousand Pounds, for the publick Service of the Kingdom: And that Sir Geo. Savill, Lord Bruce, Sir Henage Finch, Lord Howard, Mr. Pierpont, Sir John Potts, Lord Falkland, Sir Edward Turner, Mr. Holles, Sir Geo. Booth, Sir Ralph Bancks, Sir John Bowyer, Lord Angier, Sir Edward Hales, Mr. Annesley, Colonel Popham, be the said Committee. Ordered, That the Lord Bruce do acquaint the Lords, that this House hath agreed to a Committee of a proportionable Number of the Members of this House, to go into the City. Ordered, That the Lord Bruce do, To-morrow Morning, carry this Message to the Lords, as soon as they sit.